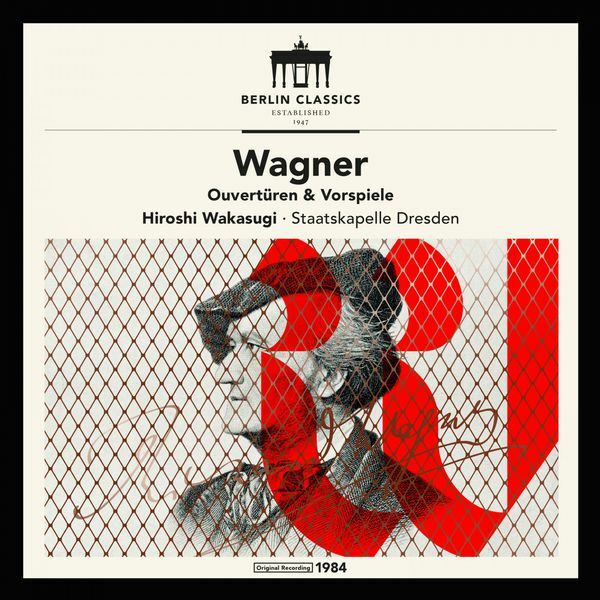 Another disc of Wagner overtures to sit on your shelf next to Böhm, Solti, Elder, Järvi, Barenboim, Boult....In fact, Hiroshi Wakasugi need fear no comparison with any of those luminaries—his collection turns out to be up there with the best. The Dresden orchestra demonstrates, yet again, their keen sense for Wagner’s idiom, the early digital sound, from 1984, though a little dry, is clear and involving, and the conducting is expansive but with plenty of detail and rhythmic focus. Hiroshi Wakasugi (1935–2009) was born in New York to Japanese parents. He trained in Japan, then divided his career mostly between Japan, West Germany and Switzerland. In Japan, he was known as a new music specialist, conducting the national premieres of Penderecki’s St. Luke Passion and Zimmermann’s Die Soldaten. He was also the principal conductor of the WDR SO 1977–83 and of the Zürich Tonhalle 1987–1991. As an opera conductor, he held appointments at Deutsche Oper am Rhein, New National Theater Tokyo, and with the Semperoper Dresden. All of which suggests a conductor with a good working knowledge of the German repertoire, which this recording fully vindicates. Wakasugi generally takes slow tempos, and the soundscape always has breadth and scale. Yet he also retains a keen focus on the direction of the music, and draws strong attacks from the woodwind and brass. That, combined with the sheer quality of the orchestral playing, gives Wakasugi considerable interpretive freedom—not having to head straight into the respective operas is probably an advantage too. He takes risks, not all of which pay off. The Rienzi Overture is too slow here: The gentle introduction feels like it will never get going, and the following Allegro energico is anything but. He also sometimes pushes the brass too far, compromising their trademark tonal precision. In particular the Lohengrin act III Prelude, taken slow and with very loud brass interjections, is too much for the horn section, who audibly struggle. The best of these performances is in the quieter music, where the strings come into their own. The Tannhäuser Overture and Lohengrin act I Prelude are both magnificent, with Wakasugi maintaining the long lines at his steady tempos—like Thielemann but without the frown. The Flying Dutchman is also given a weighty reading. The brass are more secure here, making this an ideal program opener. The recording was made in a Dresden church, the Lukaskirche, and the resulting audio is studio quality. Berlin Classics describe this release as a 2017 remaster (by Christoph Stickel), so there may have been some modern magic worked on the tapes. The dynamic range is very wide, so don’t turn up the volume too high for the opening of Tannhäuser or you’ll be in for a shock. This is being marketed as a historic reissue, based I suspect more on the reputation of the orchestra than the conductor. Sadly, there isn’t much else from him in the catalog; he seems to mainly appear on opera selections CDs, many featuring Wagner. Still, I’d have liked to have heard a full Lohengrin from him; the Prelude here suggests he’d have done something special with it. The only other regret over this excellent release is its short running time, the premature ending emphasized by the unusually abrupt close to the Lohengrin act III Prelude. It leaves you wanting more. 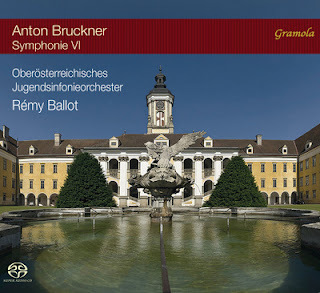 This the fourth in a series of Bruckner recordings from conductor Rémy Ballot on the Gramola label, and the second to feature the Upper Austrian Youth Symphony Orchestra, following an Eighth Symphony with them in 2014 (Gramola 99054). All were recorded at the Brucknertage, a festival of the composer’s music held annually at the St. Florian monastery where he spent the early years of his career, and where he is buried—the basilica there obviously having strong connections with the composer’s work, but also providing a “cathedral of sound” atmosphere, conducive, in theory at least, with the scale of his symphonies. The first thing to say about this interpretation is that it is long. Very long. At over 69 minutes it is well within Celibidache territory. In fact, it is even longer than the one currently available Celibidache recording, with the Munich Philharmonic from 1991 (Warner 56694), which times in at 66 minutes. That makes Ballot a strong contender for the slowest reading on record, a dubious honor indeed. So why the snail’s pace? My guess is that Ballot is negotiating a resonant church acoustic and feels he needs space to bring out the details. But if so, I’d expect to hear tightly shaped phrases and long pauses after climaxes, neither of which he offers. Also, the acoustic doesn’t sound too resonant on the recording, bar a slight and distant echo on the lower brass after some tuttis, although close-up miking may be the issue here. The comparison with Celibidache is instructive, as it demonstrates how fluid the older conductor’s stately tempos were. Ballot, by contrast, rarely uses significant tempo changes to shape the music significantly, and only speeds up when the score obliges him, and even then it seems under duress. The youth orchestra, to its credit, copes well with the inevitably drawn-out phrases, with the woodwinds in particular holding their tone across the long lines. The unity of the string sound is impressive for a youth orchestra, although their tone lacks character, and it would be nice to hear a bit more punch from them on the few occasions that Bruckner has them lead the charge into a climax. The brass sound is impressively controlled, with the narrow-bore instruments giving a good measure of central European color. Typically for a youth orchestra, the brass section is bolstered, with six horns playing four parts, and four trumpets and trombones playing three parts each. But the results balance well with the rest of the ensemble and never overpower. The SACD audio favors precision over atmosphere, for reasons surmised above, and does full justice to all of the young players. Ultimately, though, Ballot’s slow and unimaginative conducting makes this release little more than a souvenir or a curiosity. A few seconds of applause is included at the end, but it doesn’t sound very enthusiastic.